The Sand Dollar Queen Mouse is a breed of mouse found in the Sunken City. It is known to drop a variety of loot. The Sand Dollar Queen Mouse has no specific preference for any kind of cheese. The Sand Dollar Queen Mouse is susceptible only to Hydro weapons. It can be found in the Pearl Patch and Sand Dollar Sea Bar zones while on a Dive in the Sunken City. The Sand Dollar Queen Mouse drops the Sand Dollar Egg during the annual Spring Egg Hunt. 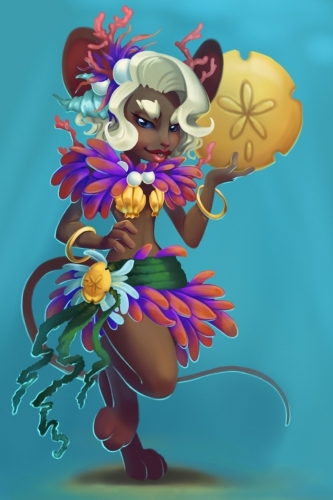 The Sand Dollar Queen Mouse was released 2 July 2014 as part of the Sunken City content. When released, the Sand Dollar Queen Mouse had a different description. This was changed after a week. Queen of the sand dollar salsa! This queen of the dance seafloor implements Sand Dollars into all of her cutting-edge salsa routines and fashion tips, and she also keeps them as wonderful pets! Her special affinity to Sand Dollars allows her to communicate with them. They keep her updated on what's going on under the sea and provide constructive criticism of her performances. This page was last edited on 23 April 2015, at 16:37.